While permanently living in a hotel doesn't sound too enticing (unless you're an eccentric billionaire), the idea of having a nice robe and constantly refreshed amenities sounds pretty alright. You can bring hotel living to the comfort of your own space with a few simple additions. Just add a "Do Not Disturb" sign to the door and you're set! 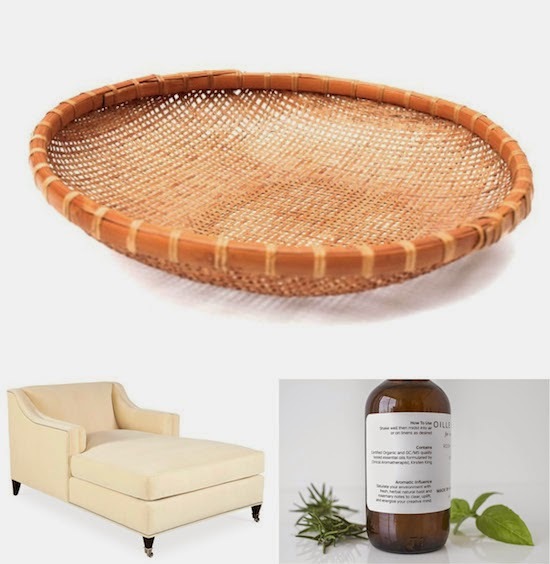 rattan basket on Etsy, with a retro tropical feel. // Plush seating // Hotels usually have the comfiest of chairs and bedding - or at least it's arranged to look comfortable. Whether in your bedroom or in a living room nook, carve out some space for a small reading area with a chair and an ottoman or side table. We found a luxurious chaise from One King's Lane that's pricey but gorgeous. Add a throw pillow and blanket for added effect! // Have a unique scent // Travel Channel's Hotel Impossible designer shared some tips on bringing luxury living to your home via this post. She suggests burning incense to mimic the unique scents hotels use to evoke a certain feel for the area. If you're not a fan of the sometimes overwhelming incense scent, try a room spray like this.